The invasive zebra mussel has quickly taken over much of the Great Lakes waterways of the United States. The immediate goal is to curb the spread of these deleterious invaders. A small mussel, with a maximum shell size from 3.5 - 4 centimeters, the zebra mussel is usually found in large clusters. It is most likely to be confused with Dreissena bugensis, the Quagga mussel, which is also an introduced species to North America. The native false dark mussel, Mytilopsis leucophaeata, is likely the only native mussel that can be confused with the zebra mussel. Zebra mussels have a salient zebra-like striped pattern on their shells, and also lie flat on a smooth surface, unlike many other mussels. Ecological Threat: Zebra mussels are known to have caused alarming declines in populations of fish, birds and native mussel species and can disrupt a city's entire water supply system by colonizing the insides of pipelines and restricting the flow of water. Zebra mussels also damage boat hulls, plug water systems used in boat motors, air conditioners and heads and cause navigation buoys to sink. Millions of dollars are spent each year controlling, cleaning and monitoring zebra mussels in other states. Zebra mussels have a high rate of filtration (especially at high populations) which has led to increased water clarity and sunlight penetration by decreasing the amount of beneficial phytoplankton like diatoms and green algae. Increased sunlight penetration leads to increased water temperature as well as an increased Secchi depths (the depth that light penetrates underwater). This may be deleterious, in that different organisms live within various strata of the water column. Once those strata disappear, so may the organisms. Zebra mussels also feed on zooplankton, and have been associated with their declines as well. Zebra mussels pose a real threat to native mussels by competing for food and attaching to their shells. A zebra mussel colony can eventually smother a native mussel colony. In addition to their ecological effects, zebra mussels have a negative impact on the economy. Zebra mussels have the ability to adhere to just about any substrate. Due to their sessile nature, once the veliger larvae has bound to its substrate of choice, mussels develop into adults and are permanently secured via anchors known as byssal threads. These byssal threads allow many zebra mussels to cluster together on various types of substrates including pipes, boats, boat trailers, buoys and dinghys. High cost has been associated with removing zebra mussels from intake pipes to power plants, piping associated with air conditioning, fire hoses, and many others as they constrict water flow. The mussels may also sink buoys, destroy fishing equipment, and take over objects left in the water for a long period of time. Biology: Zebra mussels are capable of invading new ecosystems through adaptive and anthropogenic factors. First, zebra mussels possess a free-floating larval stage called a veliger stage. Zebra mussel veligers may float in the water column for up to a month, allowing for transportation in ballast water, irrigation water, or pipes for local water supply. The veliger stage, in addition to the ability to breed within the first year of life (as well as aggressive feeding rates) allows zebra mussels to multiply and expand their territory rapidly. 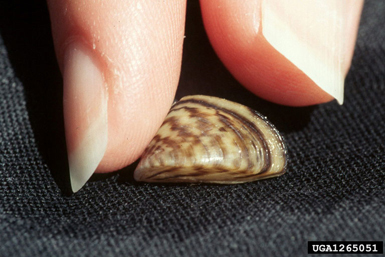 Adult zebra mussels are able to attach to a wide range of substrates, including boats, boat trailers, or even algae. This allows for easy invasion of multiple lakes if boaters are neglectful of vigorously checking and cleaning their boats. Many states' Department of Natural Resources have attempted to inform and alert boaters of this issue to avoid further invasions. History: The Zebra mussel was first observed in North America in 1988 in Lake St. Clair (a body of water that is on the border between Michigan, USA and Ontario, Canada). Since then the zebra mussel has spread to various states located along the Mississippi Waterway, and has been recently reported in Texas, Utah, and California. U.S. Habitat: Indigenous to lakes, zebra mussels prefer slow-moving water. They are still found in rivers and streams, but their populations are high in lakes. Very turbid water minimizes zebra mussel populations. U.S. Present: In Texas, fifteen Texas lakes across five river basins are currently (January 2019) classified as "infested" with zebra mussels, meaning that the water body has an established, reproducing population: Austin, Belton, Bridgeport, Canyon, Dean Gilbert (a 45-acre Community Fishing Lake in Sherman), Eagle Mountain, Georgetown, Lady Bird, Lewisville, Livingston, Randell (access for Denison residents only), Ray Roberts, Stillhouse Hollow, Texoma, and Travis. Zebra mussels or their larvae have been detected on more than one occasion in these water bodies: Fishing Hole (a small lake connected to the Trinity River below Lake Lewisville), Grapevine, Lavon, Richland Chambers, Waco, and Worth, as well as river reaches downstream of infested lakes on the Colorado, Guadalupe, Lampasas, Leon, Little, Red, and Trinity Rivers. These water bodies are classified as "positive" for zebra mussels. Zebra mussels or their larvae have been found once in recent years in Lakes Dunlap, Fork, Granger, McQueeney, O.H. Ivie, Pflugerville, Ray Hubbard, and Walter E. Long, and therefore these lakes are classified as "suspect". Several other lakes are considered "Inconclusive" due to recent DNA-only detections. If you believe you have found a zebra mussel, please report this species. Distribution: Outside of Texas, zebra mussels are widespread in the Great Lakes area and throughout the Mississippi River Basin. False Dark mussel, Mytilopsis leucophaeata, a native species of mussel. There are many methods that have been investigated to help control zebra mussels. They are listed below in no particular order. Some methods will work better than others in various situations. Boat movements have long been recognized as the primary vector for overland transfer of zebra mussels. Decontamination of boats with attached mussels is key to prevention, so please, Clean, Drain and Dry your boat, trailer and equipment. Hebert, Paul, B. W. Muncaster, and G. L. Mackie. "Ecological and Genetic Studies on Dreissena polymorpha (Pallas): a New Mollusc in the Great Lakes." Canadian Journal of Fisheries and Acquatic Sciences . 46.9 (1989): 1587-1591. Ricciardi, Anthony, Richard Neves, and Joseph Rasmussen. "Impending extinctions of North American freshwater mussels (Unionoida) following the zebra mussel (Dreissena polymorpha) invasion." Journal of Animal Ecology. 67.4 (1998): 613-619. Johnson, Ladd, and James Carlton. "Post-Establishment Spread in Large-Scale Invasions: Dispersal Mechanisms of the Zebra Mussel Dreissena Polymorpha." Ecology. 77.6 (1996): 1686-1690. Zebra Mussels in Texas: Assessment of relative risks to fishery resources, recommendations for action, and expectations for the future. Zebra Mussels Spread to Lake Waco (Oct 1, 2014). Statewide Boat-draining Rule Takes Effect July 1 – Beginning July 1 (June 24, 2014). Public Comment Sought on Rules to Require Draining Water from Vessels on All Public Fresh Waters (April 17, 2014). Rules to Fight Zebra Mussels Take Effect in Additional Counties Sunday (March 20, 2014). Parks and Wildlife Commission Approves Expansion of Zebra Mussel Rules (January 23, 2013). Zebra Mussels Confirmed in Lake Lavon (January 21, 2013). New Rules to Fight Zebra Mussels Take Effect Dec. 10 (December 5, 2013). Parks and Wildlife Commission Approves Zebra Mussels Rules for North Texas (November 8, 2013). Zebra Mussels Found in Lake Belton and Suspected in Lakes Worth and Joe Pool (September 26, 2013). New Rules in the Works to Fight Zebra Mussels (September 11, 2013). Emergency Zebra Mussels Order Signed (July 01, 2013). Zebra Mussels Confirmed in Lake Bridgeport (June 27, 2013). Zebra Mussels Documented in Lewisville Lake (June 20, 2013). North Texans urged to be on the lookout for exotic and invasive mussels (July 27, 2011). Texans Must Declare Independence from Zebra Mussels (June 30, 2011). Texas Parks & Wildlife wages war on invading zebra mussels (May 27, 2010). Boaters and Anglers Urged to Help Curb Spread of Zebra Mussels from Lake Texoma (September 29, 2010). Zebra Mussels Spreading in Texas (August 17, 2009).